Vintage French postcard illustrating part of the A.E.F. 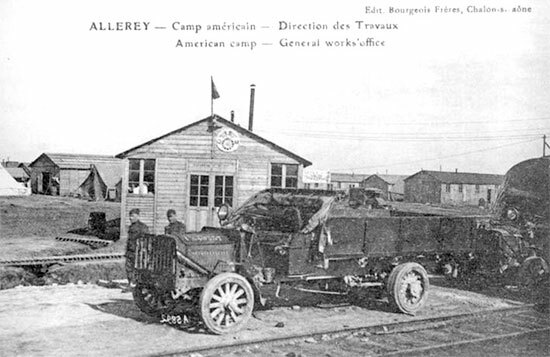 Hospital Center at Allerey-sur-Saône, France, in July 1918, where Base Hospital No. 25 was established. In the summer of 1941, the War Department requested the Cincinnati Hospital to constitute the 25th General Hospital. The project was intended to set up a medical organization similar to the one that served during World War I of the same name (Base Hospital No. 25 became part of a Hospital Center authorized December 12, 1917, comprising ten groups of Hospitals, set up in type-A barracks supplemented by additional tentage; 300 barracks were completed by July 20, and the first patients arrived on July 23, 1918; this concentration of AEF Hospitals established at Allerey-sur-Saône, eventually held 33,658 patients by March 31, 1918 –ed). Plans for the new organization gained momentum following the Japanese attack against Pearl Harbor of December 7, 1941. In 1943 the unit was finally ordered into active military service. Portrait of The Surgeon General, Major General Charles R. Reynolds (1877-1961), MC. 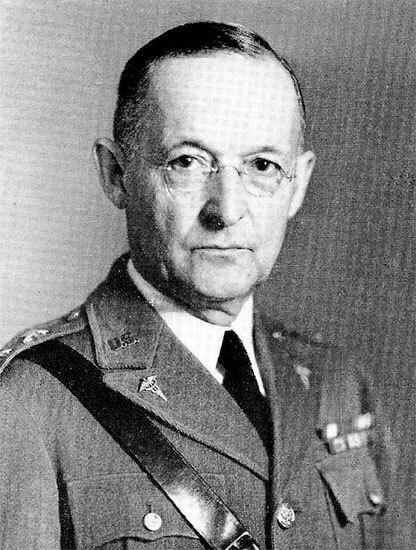 This General Officer was appointed by the US President, with the advice and consent of the Senate, for a 4-year term, and served as Surgeon General from June 1, 1935 to May 31, 1939. As early as March 1939, the Surgeon General, Major General Charles R. Reynolds, had already proposed the revival of “affiliated” hospital units; reserve units sponsored by civilian Hospitals and Medical Schools as organized during WWI (in addition to training units, affiliated hospitals consisted mainly of professional commissioned personnel, Doctors and Nurses, supplemented by Enlisted personnel, as soon as they were called to active duty as needed –ed). The original plan, approved in August of the same year, called for the organization of affiliated Hospitals to staff as many as 32 General Hospitals – 17 Evacuation Hospitals and 13 Surgical Hospitals! The challenge was enormous, with the preparation of medical organizations for field service often conflicting with operation and expansion of Hospitals in the ZI, for such new units also required personnel and equipment. After the new units had been activated and organized, they needed to be trained, fully equipped, and processed for service overseas. 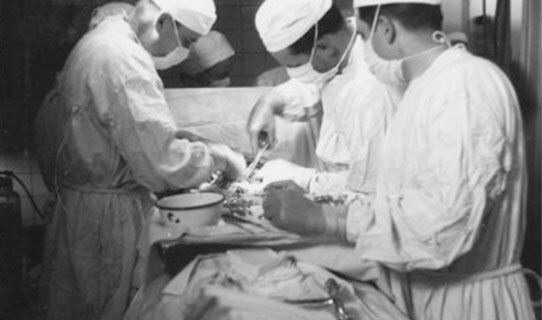 The 25th General Hospital, affiliated with Cincinnati General Hospital and the University of Cincinnati, Ohio, was officially activated June 10, 1943, at Nichols General Hospital. The Henry James Nichols General Hospital (named after Lt. Colonel Henry J. Nichols, 1877-1927 –ed), was designated a General Hospital in the Zone of Interior, by War Department directive WD General Order # 64 dated November 24, 1942. Established at Louisville, Kentucky, it consisted of a wood cantonment with an authorized bed capacity of 1717. The Hospital was ready to receive patients starting December 11, 1942. Its current specialties included Neurology – General and Orthopedic Surgery – and Neuro-Surgery. Aerial view of Henry J. Nichols General Hospital, Louisville, Kentucky, where the 25th General Hospital was officially activated June 10, 1943. Many of the selected Officers and Nurses applied for active service with the understanding that they would rejoin the 25th General at the time of its activation. 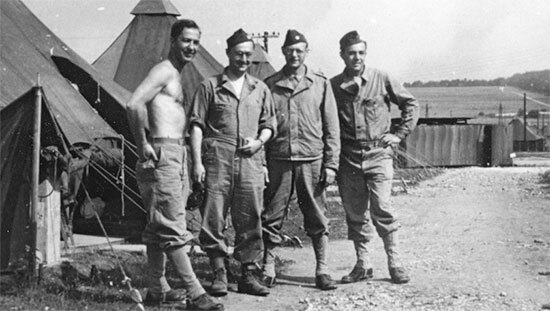 The MC, DC, and MAC Officers were assigned to duty at different locations; either at Fort Knox (Louisville, Kentucky), Fort Hayes (Columbus, Ohio), Fort Benjamin Harris (Indianapolis, Indiana), and Lawson General Hospital (Atlanta, Georgia). The Nurses were assigned to duty at the Station Hospital, Fort Knox, Ashford General Hospital (White Sulphur Springs, West Virginia), and at Lawson General Hospital. The 85th General Hospital (parent unit of the 25th General Hospital), activated September 25, 1942, at Lawson General Hospital, was transferred to the Nichols General Hospital on November 17, 1942. The new Hospital was fully organized by June 10, 1943, beginning with receiving 500 Enlisted Men, and 57 Officers (mainly Physicians from Cincinnati General Hospital), supplemented by 85 selected Nurses, 3 Hospital Dietitians, 2 Physio-Therapists, and 1 Warrant Officer. New T/Os published during 1940, listed a growth of hospital staff and personnel with an increase in professional services. It was recommended to increase a 1000-bed General Hospital from 42 to 73 Officers, and EM from 400 to 500. Following the unit’s official activation, most Officers received orders to report to the Medical Field Service School, Carlisle Barracks, Pennsylvania, for basic instruction and more training. Left: Reveille formation and Flag raising, Nichols General Hospital, Louisville, Kentucky. 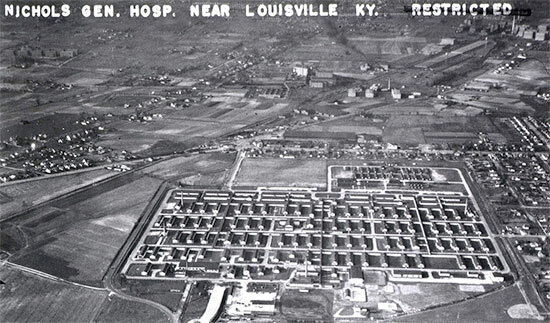 Right: Partial view of wood barracks and offices, Nichols General Hospital, Louisville, Kentucky. T/O 8-550 dated April 1, 1942, called for an organization consisting of 56 Officers – 105 Nurses – 1 Warrant Officer – and 500 Enlisted Men. In addition to military personnel, provisions were made to include 1 Head Dietitian, 2 Dietitians, 1 Head Physical-Therapy Aide, 2 Physical Therapist Aides, 2 Seamstresses, and 2 Dental Hygienists, although this was hard to achieve in the field. 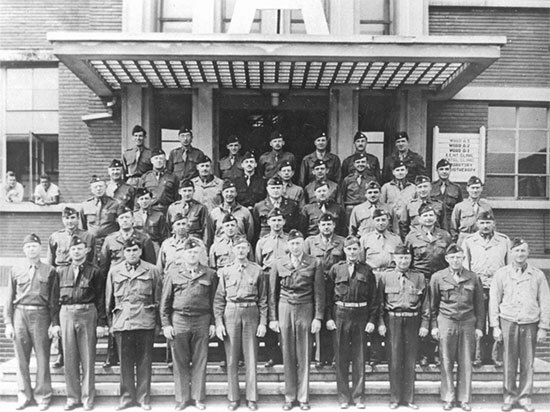 In compliance with War Department Directives and General Orders of the Fifth Service Command, all personnel and equipment were transferred from the 85th General Hospital, Nichols General Hospital, Louisville, Kentucky, to the 25th General Hospital and the parent unit was inactivated as of 1200 hours, June 10, 1943. 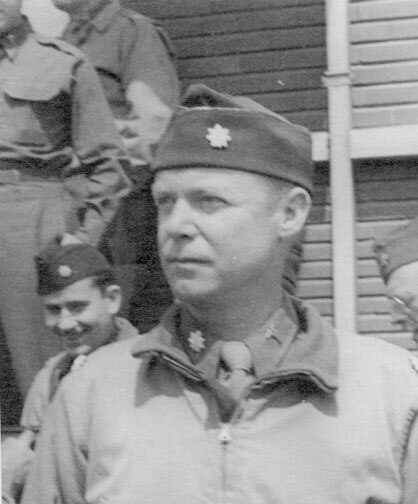 Colonel Joseph P. Russell, MC, who had been appointed CO of the 85th Gen Hosp September 25, 1942, became the Commanding Officer of the new 25th General Hospital. Captain Hattie Pugh was selected as Chief Nurse and assisted in the selection of the required nursing personnel. The personnel of a General Hospital was divided into 2 separate groups; the administrative services and the professional services. The staff and personnel, when properly organized and trained were to operate a 1000-bed hospital efficiently. General Hospitals operating in the Communications Zone were standard establishments with a normal capacity of 1000 patients, but could be expanded in an emergency to care for more than that number. It was however recommended to limit the number of patients to 2000. The organization was equipped to provide definitive hospitalization and medical and surgical treatment to all cases received. Reorganization and review of the numbers of required medical personnel influenced the authorized strength of General Hospitals, ultimately being limited to 55 Officers – 83 Nurses – 1 Warrant Officer – and 450 Enlisted Men (ref. T/O 8-550 dated July 3, 1944 –ed). Part of the unit training required the newly-constituted 25th General Hospital, to complete a 10-day bivouac at Fort Knox, Louisville, Kentucky (Armored Replacement Training Center & School; total acreage 107,148; troop capacity 3,489 Officers and 57,048 Enlisted Men –ed) that lasted from July 17 to July 26, 1943. ANC Officers were exempted from participation. During this period, the organization was rigorously tested under field conditions. Inspections, gas drill, discipline, camouflage, chemical warfare, sanitation, were part of the routine and field exercises. Prior to the unit’s departure for overseas all male personnel went through the infiltration course, and received extra chemical warfare training. Following receipt of travel orders, the unit finished packing December 18, 1943, and after a short briefing, the organization started for the train which was to take them to the staging area. They started at 1050 and departed at 1505 hours for an overnight trip to Camp Kilmer, Stelton, New Jersey (Staging Area for New York Port of Embarkation; total acreage 1,815; troop capacity 2,074 Officers and 35,386 Enlisted Men –ed). Upon arrival the following day, final processing started, including some ‘important’ exercises accompanied by the inevitable marches, and more briefings; furthermore, there was some replacement and issue of field equipment, gas mask drill, immunization shots, lecture on censorship, and the like. The assigned female personnel consisting of 100 Nurses, 3 Dietitians, and 2 Physio-Therapists had meanwhile joined the organization in time before its departure from Louisville, Kentucky. Beginning November 16, 1943, 5 American Red Cross workers completed some basic field experience training, before eventually joining the 25th General Hospital at the Port of Embarkation December 9, 1943. They included: Barbara L. Asbaugh – Helen Delbauve, Anne Finucane, Ruby Greiling, and Vera Whitney (more would join later, and some were relieved of duty and replaced by new arrivals, when serving overseas –ed). Left: Partial view of RMS Queen Mary in her wartime livery. Picture taken in a British port during World War Two. Right: Partial scene illustrating arrival of US troops at Gourock, Scotland in 1943. Between May 1942 and December 1944, 339 troopships arrived in the Clyde from the United States. They brought with them 1,319,089 GIs to the United Kingdom. Both Gourock and Greenock were very busy ports throughout the war. Then the men and women of the command entrained for their final destination. They all left at 2245, embarked on the ferry which would take them to the docks and the pier in New York harbor, where the 25th was to embark for a still ‘unknown’ destination. While rosters were being crosschecked, a colored band played “Lady Be Good”, and ARC girls provided everyone with hot coffee and doughnuts, before starting to move onto the gangplank. Time was 0245. The “Queen Mary” sailed from New York harbor at 0445, December 23, 1943, slowly moving past the Statue of Liberty with the command catching a last glimpse of friendly shores. Being a large ship, the “Queen Mary” sailed alone. She carried some 11,990 troops, not only including the 25th General Hospital, but also the 118th Antiaircraft Artillery Gun Battalion; the 6th Naval Beach Battalion, the 5th Engineer Special Brigade, and the 1st Infantry Division, as well as some miscellaneous troops (an advance party of the 25th consisting of 2 Officers and 3 Enlisted Men had preceded the main body, already departing from Louisville December 4, and embarking for the United Kingdom on December 12, 1943 –ed). Following an uneventful crossing, confronting some heavy seas, seasickness, awful British food (going hungry because of the unfamiliar food and limitations as only 2 meals were served daily, at 1000 and 2000 hours respectively), and having to spend Christmas on board, the “Queen Mary” arrived at Gourock, Scotland, December 29, 1943. The Enlisted Men and the available hospital equipment debarked on December 30, while the Nurses and the ARC workers only debarked the following day, entraining for London at approximately 1600 hours, and reaching the City at 0400 in the morning. Officers and Enlisted personnel immediately entrained for Stockbridge, England, where they arrived on December 31, 1943. Partial view illustrating some Officers of the 25th General Hospital during their stay near Stockbridge, Hampshire, England, between January and March 1944. Third Officer from left: Major Stanley D. Simon, MC. The Hospital Plant at Stockbridge, England, at the time of arrival was occupied by the 307th Station Hospital and was in fact operated on a Dispensary basis. Between December 31, 1943 and January 10, 1944, the Hospital Plant was equipped by the 25th General and duly prepared to function 100% as a General Hospital. The assigned ARC personnel would only join the parent organization on January 11, 1944. 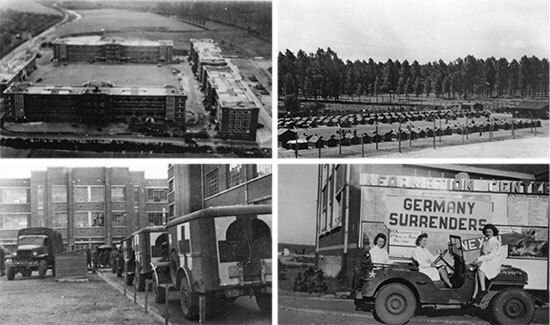 The unit closed down in March 1944, at which time it was relieved by the 48th General Hospital which now assumed full operation of the Hospital Plant. (initially built by the British Ministry of Works, it consisted of prefab one-story huts; operated as a Dispensary, which serviced principally American sick and wounded from nearby and adjoining units –ed). By March 13, 1944, the organization had completed its move to a new hospital site which was under construction at Cirencester, England (on the Estate of Lord Bathurst –ed). Unfortunately the buildings were still in the hands of the local contractors for completion. The Hospital Plant was of Nissen hut construction, well built and arranged, allowing to accommodate 1,082 patients and all personnel. 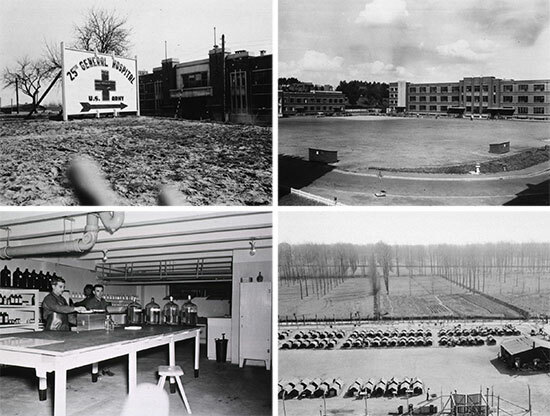 The hospital buildings were completed on April 4, and officially opened to receive patients on April 15, 1944. The grounds around the hospital area were attractively landscaped and beautified; recreation facilities were subsequently developed for patients and personnel of the command. Orders were received to start expanding the Cirencester Hospital to a 1500-bed capacity. To allow for the expansion, concrete bases were constructed over which tents were erected. On May 13, 1944, the 25th General Hospital was briefly attached to the 15th Hospital Center (with Headquarters in Cirencester) until May 18, when the 192d General Hospital started taking over the operation. The transfer was successfully completed on May 20, 1944. On the same date, the 25th was relieved from assignment to the Southern Base Section, Communications Zone, ETOUSA, and assigned to Advance Section, Communications Zone, and attached to First United States Army Headquarters, preparatory to overseas movement to the Continent. 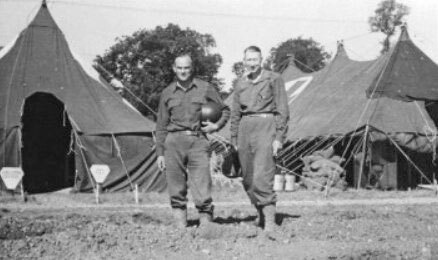 After officially turning over the hospital site to the 192d Gen Hosp, at 0001, May 20, 1944, the organization moved by motor convoy to the Fargo Tented Camp at Fargo Plains, England, to further stage and prepare for oversea movement. Movement orders were received June 17, and on June 21, 1944, the unit was transferred to Parkhouse “A”, Tidworth, England, to continue and complete preparations for the Channel crossing. Portrait of 1st Lieutenant Stella C. Book, ANC, with “Fargo”, taken during bivouac at Fargo Plains, a tented camp situated in Wiltshire, England, May-June 1944. Northern Ireland Base Section – the earliest section established in the United Kingdom, had the task of receiving and processing United States Forces on their way to the North African Invasion. Eastern Base Section – here the general hospitalization, medical supply, and preventive medicine service furnished were largely for the benefit of Army Air Forces troops concentrated in that area with the main task to carry out large-scale bombing of Nazi-held targets on the Continent. Central Base Section – operated installations and facilities within about 700 square miles in the London area to serve thousands of military personnel congregated there, a large proportion of which pertained to several large US Headquarters, particularly ETOUSA and SOS. Western and Southern Base Sections – starting in 1943, they became the chief scenes of Medical Department activity. The great majority of the Army Station and General Hospitals which began operating in the UK were located in these two Base Sections. The Southern Base Section furthermore was to become the great marshalling and training area for the Invasion of the Continent, starting in spring of 1943, and developed a large-scale medical service comparable to that of the Western Base Section. 25th General Hospital set up at Tidworth, Wiltshire, England, in June-July 1944. From L to R: Captain James R. Mack; Captain Max Haas; Captain Dudley A. Wolfe, and Lt. Colonel Edward C. Elsey. Another aspect of the same picture illustrating the Officers and M-1934 pyramidal tents. An advance party consisting of 3 Officers preceded the main body to France by approximately one week. They arrived on Utah Beach, France, on July 22, 1944, and were temporarily billeted with the 7th Field Hospital at Osmanville, near Isigny, Normandy. At 0830 hours, July 27, 1944, the main group entrained from Tidworth, England, and moved to the Southampton Marshalling Area, C-5, where they all embarked on the British “Llangibby Castle” July 23, for movement across the Channel to France. They reached Utah Beach on July 30, 1944. After transferring to LCM landing crafts, and debarkation, all personnel were moved by truck to Utah Beach Transient Area “B” where they arrived at approximately 0545, and then to a site across the road from where they moved toward Lison, where they had been instructed to establish a 1000-bed tented hospital. The site (a medical hospital concentration area) consisted of approximately 63 acres, where the necessary concrete bases were constructed for all tents, except those used for Officers and EM’s quarters. The general layout was found to function efficiently after a few minor modifications. The number of tents necessary to set up a complete 1000-bed medical facility consisted of: 90 ward tents – 241 pyramidal tents – 120 squad tents – 13 large wall tents – 19 small wall tents – and 46 storage tents. 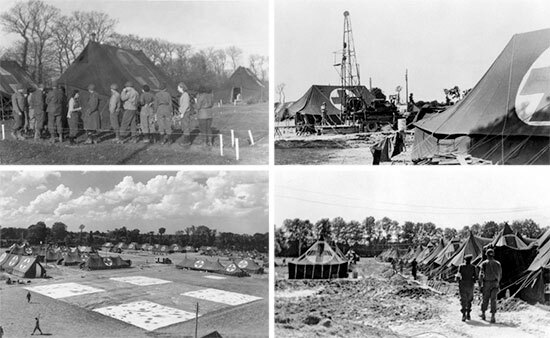 Construction of the tented hospital was started on August 2, 1944 with the assistance of the 365th Engineer General Service Regiment (colored unit, landed in France July 1, 1944 –ed), and the plant was officially opened for and received patients 13 days later, on August 15. The tented hospital plant was operated by the 25th from August 15 to November 23, 1944, and during this period the Hospital treated 3,104 patients. Most of the patients were battle casualties, including quite a large percentage of wounded German PWs. During its stay at Lison, the Hospital used 250 enemy prisoners in various jobs in and around the hospital area. The Hospital Plant at Lison was officially transferred to the 195th General Hospital and completed at 0001 hour, November 23, 1944. Some aspects of the 25th General Hospital while established at Lison, France, during the period August-November 1944. Top Left: Medical and Army Nurse Corps Officers form a line for chow. Top Right: Drilling for water at the medical concentration center. Bottom Left: Partial view of the general setup at Lison. Bottom Right: Row of tentage in the mud. An advance party consisting of 4 Officers and 50 Enlisted Men was dispatched ahead of the unit’s main body on November 18. Their task was to drive to Liège, Belgium, and secure a new hospital site. Upon arrival in the city, November 21, 1944, they requisitioned and obtained billets to house the main party which was to arrive about one week later. Following its departure at 1030 hours, November 24, from Lison, the 25th completed its move to a more permanent location in Liège, Belgium by November 29, 1944. The organization Officers and Nurses were stationed in a old school house with the EM housed in nearby apartment buildings with windows blown out, while waiting for another site to install and operate a proper 1000-bed medical facility. It had been planned to set up the 25th General Hospital in the Palais de Justice but civil authorities objected to this and the organization had to wait while another site was being obtained. November 29 to December 31, 1944, staff and personnel were utilized on Detached Service and Temporary Duty with Evacuation and General Hospitals in and around the city of Liège. Since the 25th General Hospital was not operational during the Battle of the Bulge, several members of the command continued to serve bravely with other medical units, such as the 16th General Hospital. During this time Liège was under intense rocket bombs attack and on several occasions V-1 buzz bombs fell on the city. Some fell nearby shattering glass and causing damage to the buildings, but fortunately, no direct hits were made and no casualties occurred. While located in Liège the Hospital was attached to the 818th Hospital Center (with Headquarters in Liège) starting January 10, 1945, to which it remained so until the unit’s departure from the European Theater of Operations. Picture of “Beached Bessie”, a former French ambulance used by the Germans, gift of a US Officer to the ARC. 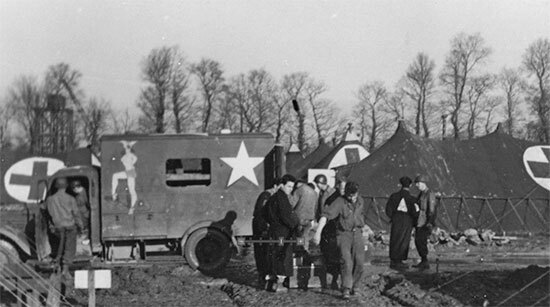 Quite heavily decorated (paintings removed by order of the CO), the vehicle first served as a transport for the American Red Cross contingent, but was later taken over by the 25th General Hospital for use as a mess truck to carry the food to the different wards, being christened “Meals on Wheels”. This vehicle saw some use during the hospital’s stay at Lison, between August and November 1944. Because the initial site selected in Liège was not readily available, a more suitable location was found in the city of Tongres, some 12 miles northwest of Liège. The five brick buildings, a Belgian Army military barracks complex, built in 1939, occupied and largely destroyed by the retreating Germans, required extensive reconstruction. It would however provide quarters and housing for the Hospital in February 1945. In the meantime, the place was occupied by the 18th Replacement Depot which seemed not happy to vacate the buildings. For a month, lasting from mid-January to mid-February 1945, the 25th General Hospital bivouacked in Morlanwez, some ten miles from Charleroi, Belgium, and set up in a vacant girl’s school. At 1145 hours, January 15, 1945, all personnel who were not on DS or TD with other organizations were moved by trucks, ambulances, and miscellaneous motor vehicles to the Lycée Warocque, Morlanwez. As the site was situated outside of the flying bomb zone the area offered a peaceful, quiet atmosphere. During the Hospital’s stay there efforts continued to obtain possession of the Caserne in Tongres and arrangements were finally completed early in February. B Company, 346th Engineer General Service Regiment (arrived in France June 27, 1944 –ed) was assigned for the repairs. Construction was begun on two of the buildings while the Replacement Depot was still occupying the site. Five (5) Officers supplemented by 100 EM of the 25th General Hospital moved from their bivouac to Tongres to assist the engineers in their work. Rooms were converted to accommodate the different Clinics and the Receiving Office. Others were adapted for use as Surgical Wards and a Patient’s Kitchen and Mess. A second building was converted to provide room for the OR pavilion and to house Central Supply, Pharmacy, and the Office of the Chief of Surgical Service, plus a large Conference Room. Additional stories, after being repaired and renovated, were adapted for use as more Surgical Wards, while the basement now housed the Medical Supply, the Morgue, the Utility Shop, the Clothing Warehouse, the Boiler Room, and the Motor Pool Garage. A third building was converted into a number of Medical Wards, Clothing and Linen Exchange, Medical Supply Stores, an office for the Chief of the Medical Service, and the Medical Library. The fourth building was destined to quarter the entire EM personnel. The same building contained a Chapel, the Enlisted Men’s Mess, Detachment Headquarters, and the Officers’ and Nurses’ Mess. The basement was reserved for the PX, the Barber Shop, the Tailor Shop, the Post Office, an EM’s Club and a general Library. The fifth building was used as a Headquarters building with all the necessary Offices, with Officers’ quarters on the first floor, and Nurses’ quarters on the second floor. The building’s top floor was reserved for the Officers’ Club. Operating Room, 25th General Hospital, Tongres, Belgium. From L to R: Major Daniel E. Earley and Captain George E. Schnug, assisted by a Private, in action. When the 18th Replacement Depot vacated the buildings on February 16, the personnel of the command moved into the Tongres barracks February 19, and by March 3, 1945, the first wing of the Hospital with 400 operational beds was opened for receipt of patients. All alterations and repairs were finally completed and the plant was gradually expanded, increasing its capacity to 1000 beds which was reached by March 24. 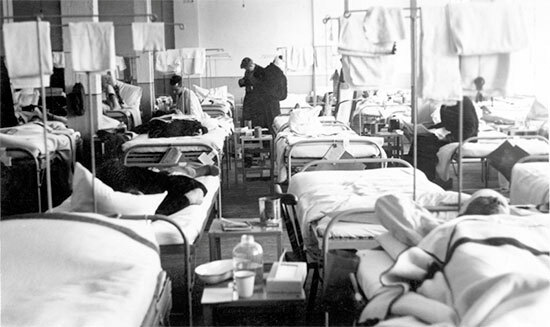 The entire Hospital now providing 1250-beds became operational March 25, 1945. Since excellent track facilities for Hospital Trains were available at Tongres, such trains carrying from 271 to 300 patients (approximately 50% ambulatory, and 50% litter), were received and unloaded, and the train released in an average time of approximately 45 minutes per Hospital Train. Unloading teams (consisting of 1 Officer and 2 clerks –ed) had been trained in advance and a sufficient number of ambulances were provided by the 818th Hospital Center. From 80 to 100 German PWs were used as litter bearers each time a Hospital Train was received. Upon arrival the American Red Cross in conjunction with the unit’s Mess Officer provided hot coffee, chocolate, cookies, doughnuts, cigarettes, and candy, while the patients were admitted. Many patients came in through regular Admission. Outpatient service was equally supplied to nearby units and many thousand patients were thus handled without being admitted to the Hospital. As the demand for beds decreased, in line with the end of the fighting in Europe, the current evacuation policy was altered to allow patients to be retained at the 25th who could be returned to duty in 60 days, 120 days, and even up to 180 days. The highest patient census in the Hospital at one time while operating in Tongres, Belgium, was 1,032. The 25th Gen Hosp continued to operate in Tongres, Belgium, until August 6, 1945, at which time any remaining patients were either discharged or transferred to other hospitals. This was in preparation for the organization’s move back to Rouen, in France, where it was to relieve the 179th General Hospital. Partial view of a Surgical Ward at the 25th General Hospital, during the unit’s stay at Tongres, Belgium, note the high number of beds concentrated in the area. Following V-E Day, Redeployment was instituted causing considerable change in the Hospital’s personnel. The 25th lost medical personnel to serve as Chief of Sections or Services in other General Hospitals, while other members were simply transferred out of the organization. About mid-November 1944, a rotating plan had been inaugurated whereby Battalion Surgeons who had been on duty for a long period of time were to be relieved by Medical Officers of fixed installations. When Redeployment was at its height in June 1945, a high number of Medical Officers were once more transferred. Since many of them had low points, they were transferred to other medical installations scheduled to ship directly, or indirectly, to the Pacific Theater. In the meantime, Colonel Joseph P. Russell was ordered to return home on June 29, 1945. Temporary setup of 25th General Hospital at Liège, Belgium, during January-February 1945. Top Left: Schoolhouse where the organization Headquarters and Administration were temporarily housed. Top Right: Doctors’ and Nurses’ quarters in Liège. Bottom Left: Apartment buildings where the Enlisted Men were temporarily quartered. Bottom Right: Train tracks in the snow, Morlanwez, Belgium. Between August 6 – August 11, 1945, the equipment of the 25th General Hospital was transferred and the necessary arrangements made to complete the move back to Rouen, France. The personnel left Tongres by train at 1410, August 11, and reached Rouen at 1030 hours, August 12, 1945. On August 14, 1945, the organization took over the complete operation of the 179th General Hospital at Rouen (at this time there were still approximately 500 patients in the Hospital –ed). The new site consisted of two main sections steeped in history and traditions. The older section, the Hôtel Dieu, had been built approximately 800 years ago and had housed the original Collège Médical of the city of Rouen. The newer section of the Hospital had been completed in 1939 and was quite a modern structure with a 1000-bed capacity. The 25th Gen operated the Hospital Plant at Rouen until September 21, 1945, at which time the installations were turned over to the 168th General Hospital. Top left: General entrance and sign indicating the 25th General Hospital, when established at the former Belgian military barracks (5-building complex), at Tongres, Belgium. 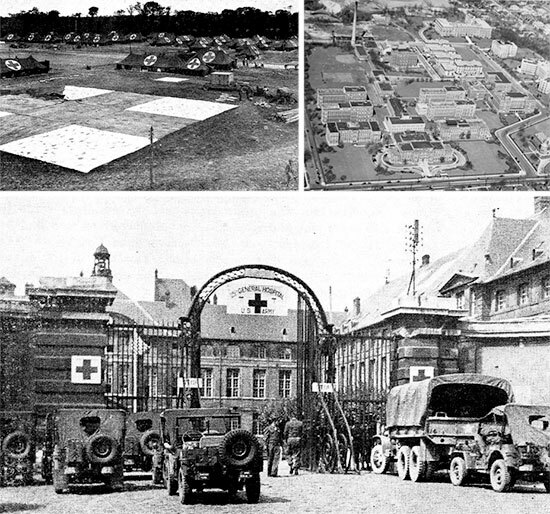 Top right: Partial view illustrating the athletic and parade grounds in front of the 25th General Hospital, Tongres, Belgium. Bottom left: Interior view of the 25th General Hospital’s Pharmacy, Tongres, Belgium. Bottom right: View of the enemy PW enclosure near the military barracks complex occupied by the 25th General Hospital, while operating at Tongres, Belgium. As soon as the patients and the property were transferred to the 168th Gen Hosp the remaining personnel of the 25th were billeted with the relieving unit awaiting orders to return to the Zone of Interior. The ANC Officers did not come home with the organization but preceded the unit. 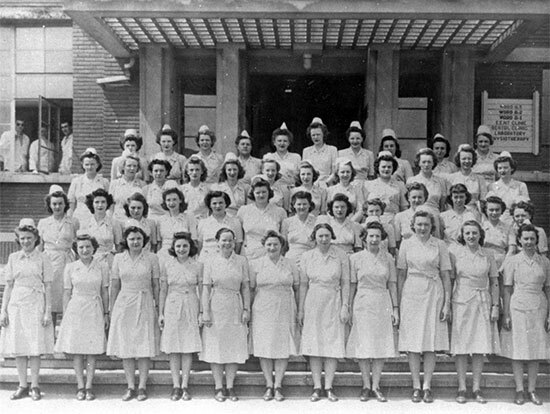 Twenty-two (22) Nurses were transferred out of the Hospital September 17, 1945, and returned to the United States with another General Hospital. Any remaining ANC personnel were transferred early in October with the exception of 4 Nurses who were away from the unit on leave to the French Riviera or Switzerland. These Officers were also transferred out of the 25th before sailing to the ZI. On November 4, 1945, the remaining personnel of the Hospital left Rouen by motor transportation and arrived at Camp Phillip Morris, near Le Havre, France on the same date. The 25th General Hospital sailed from Le Havre November 10, and arrived at New York on November 19, 1945. The remaining members then moved from New York POE to Camp Shanks, Orangeburg, New York (Staging Area for New York Port of Embarkation; total acreage 2,009; troop capacity 2,545 Officers and 46,367 Enlisted Men –ed), arriving there on November 20. At that time all personnel were transferred to different Separation Centers for discharge from the service. The 25th General Hospital was inactivated on November 20, 1945. Setup of 25th General Hospital at Tongres military barracks, Belgium, from March to August 1945. Top Left: Aerial view of the military buildings complex. Top Right: Partial view of the PW enclosure holding 250 German prisoners attached to the Hospital. Bottom Left: Picture showing some ambulances ready to unload their patients at the Hospital. Bottom Right: ARC ladies in a jeep in front of a panel announcing the surrender of Germany and V-E Day. 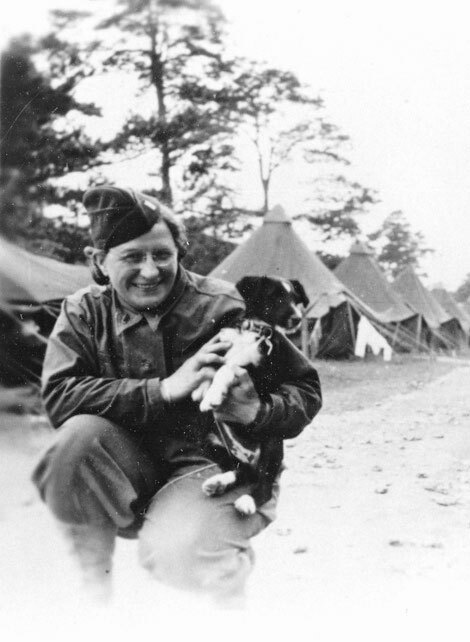 Picture illustrating Major Jean M. Stevenson, Chief Surgical Service, during the hospital’s stay at Tongres, Belgium, March-August 1945. From L to R: Picture illustrating the Commanding Officer of the 25th General Hospital, Colonel Joseph P. Russell, MC, and his Executive Officer Lt. Colonel Herman J. Nimitz, MC, during the unit’s stay at the Lison medical concentration center, France, August-November 1944. Group of Officers of the 25th General Hospital, in front of the main entrance to one of the military barracks occupied by the unit at Tongres, Belgium. 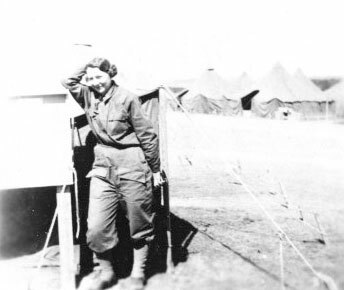 Picture illustrating Captain Hattie E. Pugh, Principal Chief Nurse, 25th General Hospital, during the organization’s stay at Stockbridge, England, January-March 1944. Group of ANC Officers of the 25th General Hospital, in front of the main building occupied by the unit at Tongres, Belgium. 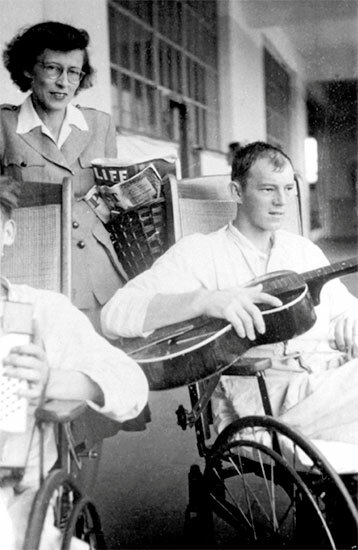 Picture illustrating Miss Barbara L. Ashbaugh, ARC Assistant Field Director, serving with the 25th General Hopital, with patient. Staff Sergeant Oscar E. Hamilton, R-564659, MD ???? 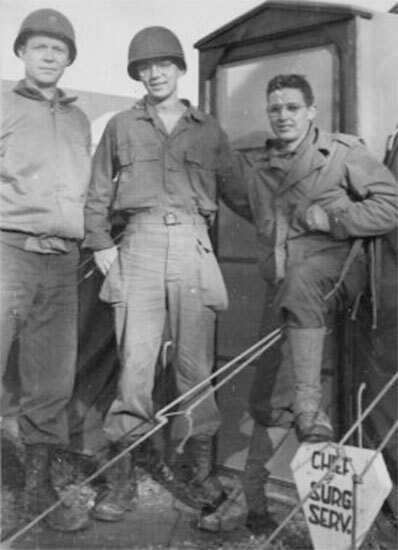 From L to R: Picture illustrating Major Jean M. Stevenson; Sergeant Joe L. Parson; and Private Charles E. Batch, while serving at Lison, France, during summer of 1944. 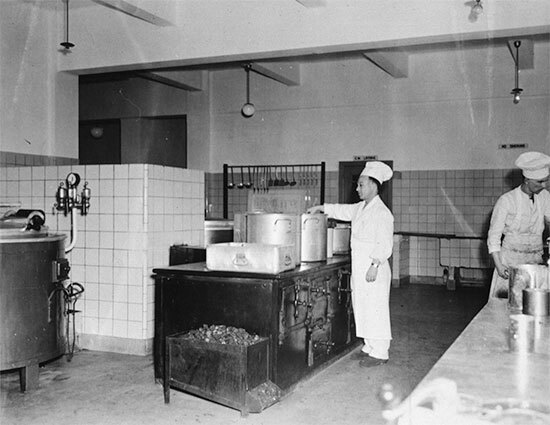 View of the centralized kitchen set up by the 25th General Hospital while stationed at Tongres, Belgium, summer of 1945. 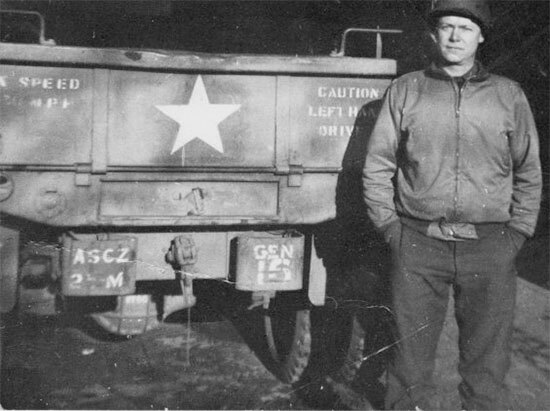 Major Jean M. Stevenson, MC, Chief Surgical Service in front of one of the workhorses operated by the 25th General Hospital, the ubiquitous 2 1/2-ton cargo truck (the unit’s markings are duly represented: ASCZ 25M GEN 15). Photo taken in December 1944. 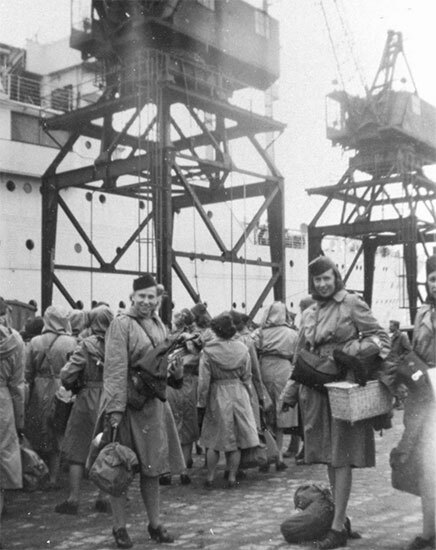 Group of ARC personnel ready to board ship for return to the Zone of Interior, August 19, 1945. 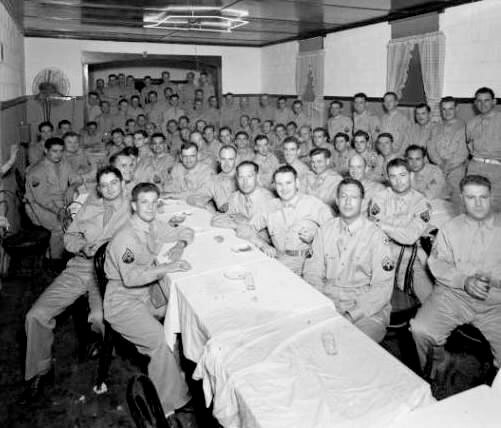 NCO dinner party held after completing the 10-day bivouac at Fort Knox, Louisville, Kentucky during summer of 1943. 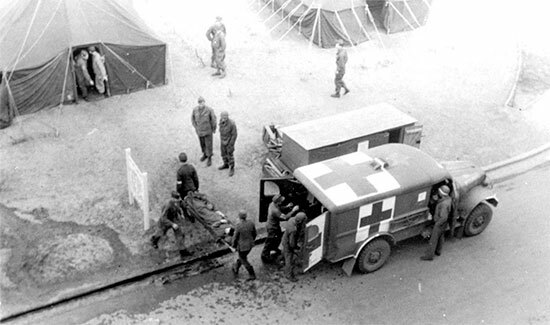 A patient arrives at the 25th General Hospital, Tongres, Belgium. The soldier is transferred from the 3/4-ton ambulance to the Receiving by PW litter bearers. 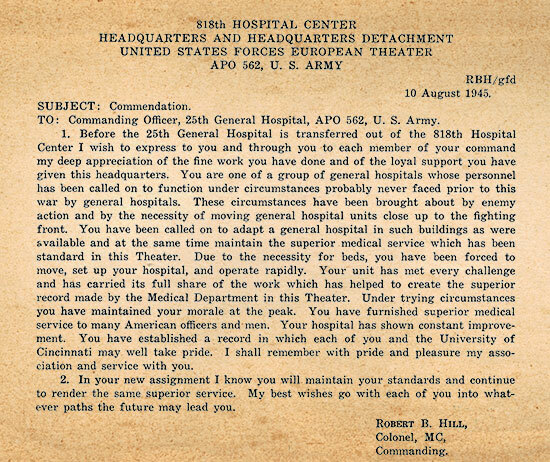 Official Commendation dated August 10, 1945, and signed by Colonel Robert B. Hill, CO 818th Hospital Center, USFET, APO # 562. Miscellaneous scenes depicting the 25th General hospital installation sites. Top Left: Lison, France, tented camp. 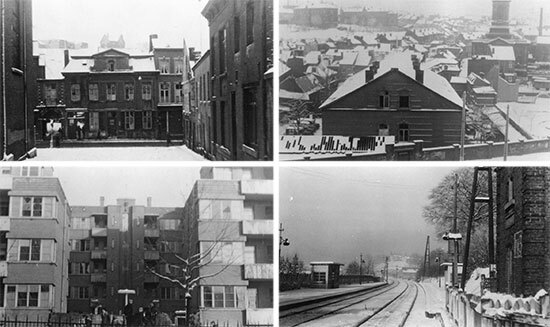 Top Right: Tongres, Belgium, buildings. Bottom: Rouen, France, buildings. The MRC Staff are particularly indebted to Miss Veronica Buchanan, Special Collections Librarian, University of Cincinnati, Ohio, for granting them the permission to use some of the basic texts and illustrations part of their collections covering the WWII History of the 25th General Hospital. Basic data and photographs illustrating this Unit History are courtesy of the Henry Winkler Center for History of the Health Professions, University of Cincinnati Libraries. The MRC Staff were able to add some more precision and additional historic notes while editing the texts.